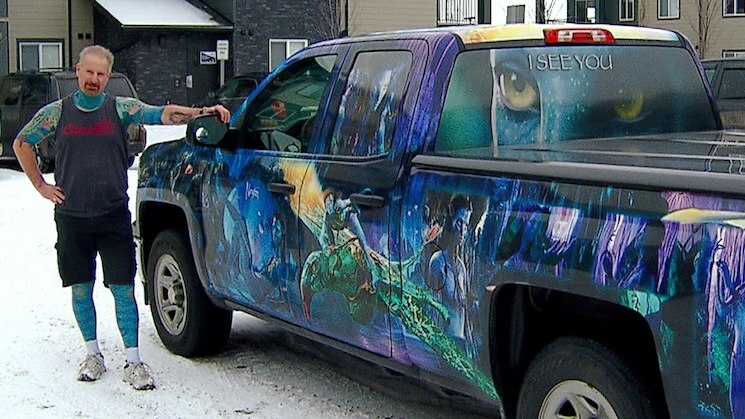 Here's something that will undoubtedly haunt you for days to come — Edmonton man Raymond Knowles has covered his entire body (and truck) with imagery from the surreal 2009 James Cameron blockbuster Avatar. Speaking with CBC News, the Edmonton carpenter known as Mr. Avatar explained that he got his very first tattoo when he saw the flick 10 years ago. Since then, he hasn't been able to stop injecting blue ink into his body. "I have the blue skin colour from my head right down to my toes," Knowles told CBC News. "I have a few figures on my body as well of Neytiri, the one that pretty much inspired me to do this to myself." His truck even bears the name "NEYTIRI" on its personalized licence plate, one of many detail-oriented Avatar references that appear to have consumed Knowles' life. Watch his interview with CBC below. Unfortunately, Knowles hasn't yet revealed what he plans to do about the movie franchise's recent font change.